Image made by Michael Friesen used under the Creative Commons license. The Yamaha V50 is the most complete 4 operator fm-synth you can get. Not only does it have the 16-bit OPZII FM chip, with 16 voices of polyphony (with single and 8-program-performance-multimode) , it also has an 8-track sequencer, effects and a drummachine built in. It has a floppydrive, so you can store all of your songs and sounds on floppy. This synth came out in 1989, in a time that Korg and Roland were leading the market with their M1 and D50, using sampled waveforms as base for their sounds. The V50 uses the old FM (frequency modulation) synthesis way of producing sound. (the drummachine however, does use samples). At that time FM was already at it's demise, so the V50 was not a popular synthesizer. It sounds very like the DX7, the most popular synth from the 80ies. Yamaha was a bit behind the competition, still hoping that FM would hold on. 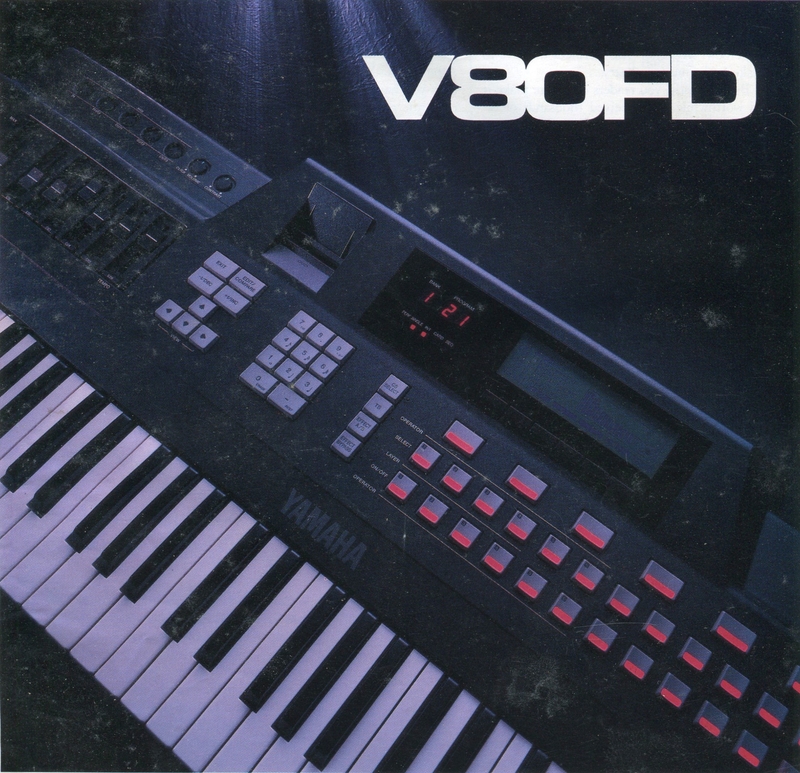 They even developed the V80FD, which was based on the DX7, with 6-operator FM, a sequencer, effects and a floppy drive, a V50 on steroids, so to speak. Sadly, the V80FD never came out, because the development of their SY77 went a lot better than they expected. 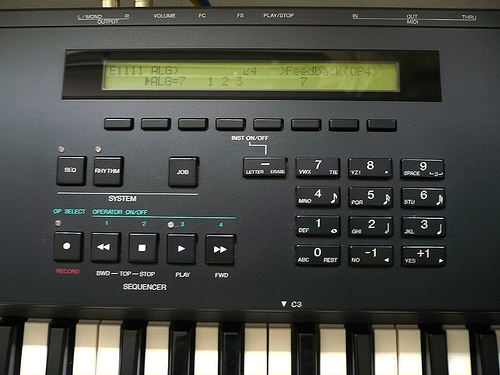 In 1990 the SY77 became the first Yamaha synth with sampled waveforms combined with FM synthesis. The Yamaha V50 was the first workstation i did gigs with. I used it a lot in church, to lead the praise and worship. At that time I thought it didn't sound too bad. The synth produces nice E-piano and bass-sounds and decent emulations of percussive sounds and reedsounds like oboe and clarinet. The sounds really come to shine through the built in DSP-effects. Programming this synth is a lot easier than it's predecessors. The parameter-groups are all well layed out on the keyboard-panel, with a button for every function. It even has an easy-edit button, to easily adjust parameters like attack, release, volume and brilliance. So there is almost no menu diving here. All parameters are very well and clearly layed out on the LCD screen. The soundengine is the same used in the Yamaha TX81Z soundmodule, with 8 different waveforms per oscillator (called operator). 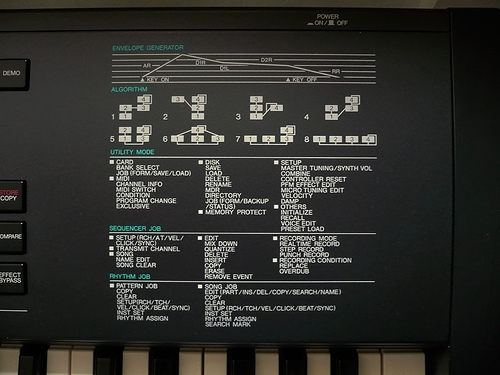 The former FM-synths like the DX7 only had sinus-waveforms. You can make thousands and thousands of different sounds with it. It is surprising how analog this synth can sound by using it in multimode and with the right effects. Don't expect to get 100% emulations of real instruments, but you might come close! -Very versatile soundpalette, with hundreds of soundbanks available. 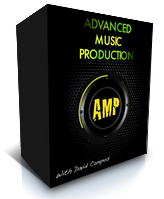 -Nice layed out workstation, easy to learn. Here is another review by Jim Atwood from Japan: Yamaha V50 Digital Synthesizer. Watch Rick Wakeman soloing on a V50 and spot a second V50 in his setup.